“Inner Sanctum” is released today on DVD, Blu-ray and CD and is available to purchase from the link below. Staged by designer Es Devlin and choreographer/director Lynne Page, the show was filmed by director David Barnard at London’s Royal Opera House during a sold-out run last summer. 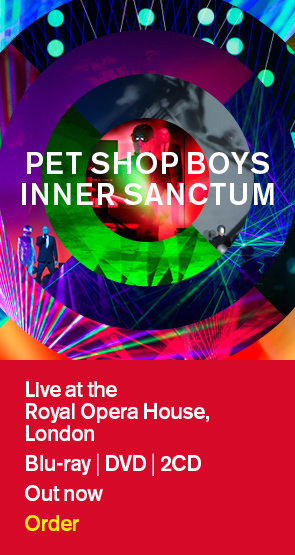 The full-length film on DVD and Blu-ray is accompanied by two CDs of the complete audio of the live show plus a bonus feature of PSB live at Rock in Rio in September 2017. Also released today is Pet Shop Boys’ once-a-year publication “Annually" which this year comes packaged with the four-track “Agenda” EP on CD. The 12” vinyl format of “Agenda” is also out today and available to buy from the link below. Interesting playlist from Lauren Laverne on BBC Sounds kicks off with PSB. Link below. Pet Shop Boys “Agenda” EP, four brand new songs, is now available to buy digitally.